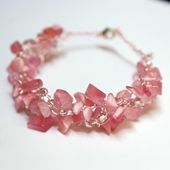 This fancy beaded bracelet is crocheted using rose-colored cat eye bead chips, plus glass seed beads and wire. Beads: I used two different kinds of beads in this bracelet. The predominant beads are cat's eye fancy chips by Beader's Choice. The color name is "Romantic Rose." The accent beads are 6/0 glass beads in a color that's somewhere between clear and pale pink. Wire: I recommend 26 gauge wire for this project. I used permanently colored copper wire in the pink silver-plated color. This wire is manufactured by Darice. Jewelry Findings: I used a silvertone lobster claw clasp. If you can find a clasp that's an exact color match for your wire, that would be an improvement, but if not just use the closest match you can find. With any of the supplies listed above, feel free to make substitutions. Measure your wrist, or the wrist of the intended wearer. Add an inch or two to this measurement to allow a bit of "ease." If you're using large, chunky beads, go for two inches; if you're using small beads, an inch is probably sufficient. You can add more ease than that if you want a very loose-fitting bracelet, or less ease if you want a tighter-fitting bracelet. The number you decide on here is going to be the length you make each beaded strand. You are going to make 3 separate beaded crochet strands, then braid them together to form the bracelet. Do one strand at a time. Start by stringing your beads onto your wire in the order you want them to appear in the finished bracelet. Leave a length of wire unworked at the beginning -- at least 4+ inches long. (Do not count this length in your finished measurement.) Make a slip knot. [Slide a bead right up close to your crochet hook. Reach around the bead with your hook and grab the wire; pull a loop through to make a chain stitch with a bead caught inside.] Repeat the sequence noted in brackets until your strand is the length you decided you want to make. Leave another 5-6 inches of wire at the end. Cut the wire and pull the end through your active loop. Set the piece aside while you make the other 2 strands. For my sample bracelet, I made 2 strands using just the rose cat-eye chips and the other strand using just the seed beads. Align the strands so that you are holding them with the starting slip knots all in the same place. You should have 3 ends of wire poking out; braid these together as tightly and neatly as you can. Then shift the bracelet so that you can comfortably braid all three strands together. You'll want to braid slowly and manipulate the strands as you braid, so that the beads all sit nicely and look good where you put them. When you are finished braiding, braid the other 3 ends of wire together, again making the braid as tight and neat as you can. Tip: It's hard to hold the work and braid at the same time. If you have a clipboard handy, you can clip the work to the clipboard and then do your braiding. If not, you could have a friend hold the work while you braid. Attach one part of your closure at each end by slipping it over the braided part and then doubling the braid back over itself and twisting it together. Cut the ends neatly to finish. Nobody designs anything in a vacuum; designers are typically inspired or at least influenced by what they see around them. I'm no different. About six weeks prior to creating this bracelet, I looked at bunches of pages on the topic of crocheted wire jewelry. You can find those pages linked from my page of crocheted wire jewelry patterns. All of those pages deserve a spot on my list of references for this page.